Samepage is a platform that enables efficient team collaboration for businesses. It optimizes various areas such as the creation of schedules, discussion topics, meeting agendas, files, instant messages, conversations, and task lists. It can also compile files, images, videos, conversations and maps on one page to facilitate easy collaboration. The app can share pages with anyone, which means your team can be kept up to date and in sync. In this article we’ll analyze all major Samepage pros and cons to give you a solid overview of the software’s capabilities, so you can decide if it’s a solution that will actually be useful to your company. Samepage is hailed as one of the best collaboration software suites in the market. The vendor offers a really flexible pricing plan that can be adjusted to a specific work process and budget, along with an excellent free trial plan. You can use the free trial period to check out the app’s features and find out how it can help your company. The vendor also offers native mobile apps to help team members access the service from anywhere, on any device. Files stored in popular file-sharing services such as Google Drive, Dropbox, Box, and OneDrive can all be incorporated in a Samepage page. Emailing is a necessary task to do at work. However, the process itself is so tedious that answering mails and checking updates interrupts other tasks during the day, not to mention other possible issues such as misunderstandings and the lack of group communication. Samepage’s personal chat service integration with other project functionalities helps to make email work easier. In addition, it also allows you to choose your online channels for communication and to keep employees on board even when they’re out of office. This enables clearer and more timely correspondences and effective division of tasks to ensure the business’ success, making Samepage the platform of choice among public administrations, growth-orientated companies, and even nonprofit organizations. Through its collaboration features, Samepage improves the level of productivity during meetings, keeping everyone on board and allowing them to share information. Its ability to let you share any type of content like videos, photos, spreadsheets, and text all on one page allows for better project management. All the project details are lined up so you can better assign tasks to the individuals responsible for each piece. 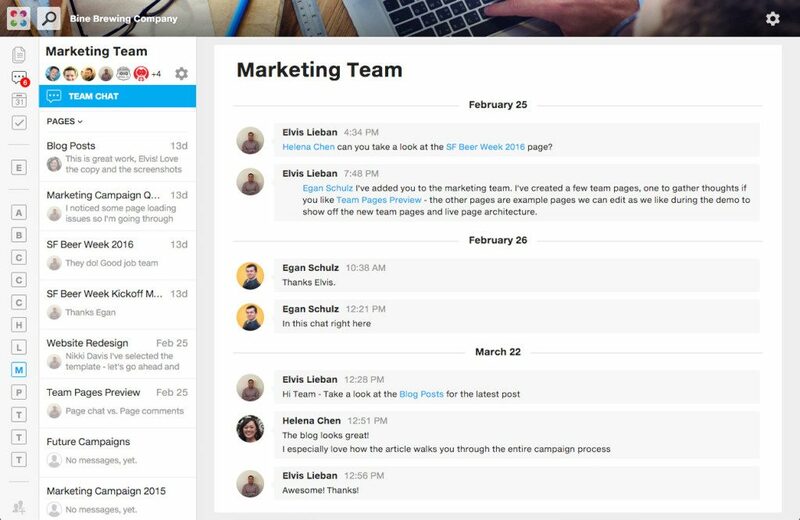 With your team and your content on the same page, managing these types of projects has never been easier. At the same time, accurate information is ensured based on commodity and fingertip-reachable information that is being shared. Samepage lets you create a collaborative workspace where you can keep the newest version of every form in a simple manner. In addition, you can even empower your partners to take control of the files so your team always has the most up-to-date information. Even when a team member is not following developments, the member gets an instant notification for any changes, such as every modification that has been performed on a file for instance. This does not necessarily mean that the old versions are irreversibly lost. The originals are always preserved in the File Library, and you can locate them easily by using an advanced search filter. Once you’re in, the platform provides offline access to documents, and this is not such a common feature in the world of online business collaboration. Samepage is intended to serve the purposes of businesses of all sizes and activities, which means whether you have a small, mid-sized, or large company, Samepage can address your needs for that business. As for pricing, there is an excellent free package we recommend for starters or mini-businesses. The free package provides access to an unlimited number of users, together with the ability to create 25 pages and to store 25 GB of valuable documentation. You can learn more about Samepage pricing in our detailed review. The developers of Samepage designed a safe and uninterrupted product with built-in safeguards for data protection. The security architecture itself is robust with daily data backups, continuous testing, and reliable support. The best part of the process is that support visible is ensured through every component, practice, and technical service. You can find a more detailed analysis of Samepage features and benefits in our review of the software. Like any other software, Samepage has a few disadvantages. However, these are minor drawbacks that are clearly outweighed by the the platform’s benefits. Some users would like to see a richer API that offers access to Samepage’s technology and manipulate them for more apps. There could also be more features offered in the free plan for small and medium-sized businesses. Luckily, the vendor can easily focus on improving these relatively minor points in the future to boost the effectiveness of their platform even further. Our detailed analysis of Samepage pros and cons shows that the app offers numerous advantages to its users and it’s a great team collaboration tool to have in your business. The platform is easy to set up and integrates smoothly with popular apps to further boost its effectiveness. What’s more, it has a very flexible pricing plan that addresses the various needs of your business. You can easily try out the capabilities of Samepage with their free trial plan.